Following a successful trial, we now subscribe to Elsevier’s ClinicalKey. 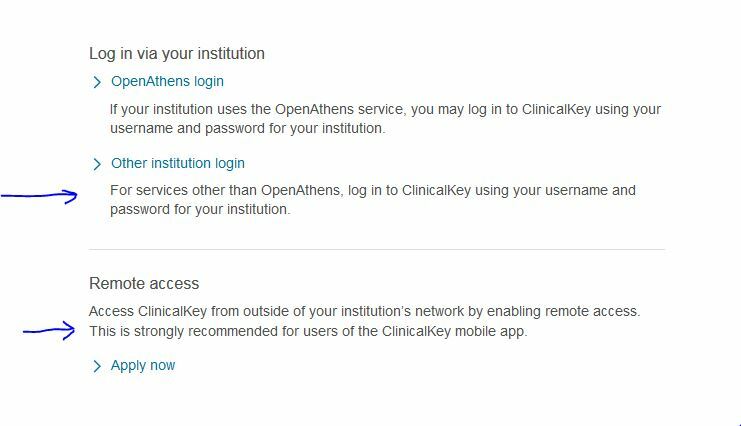 Choose “Other institution login” or “Remote Access” to set a personal account. This will allow you to save articles/images, searches/search history, change language, store presentations, set up table of contents alerts etc. ClinicalKey can be accessed via the Medicine Databases A-Z list and DiscoverEd. The individual e-book and e-journal titles have been added to DiscoverEd. Where there is a restriction on downloading an e-book for offline reading from the ClinicalKey website, we will maintain access on the Elsevier e-Library website where this is allowed – both links will be displayed in DiscoverEd. This entry was posted in New e-resources, Updates and tagged Clinical search engine, ClinicalKey, database, e-books, e-journals, Elsevier, Medicine on May 17, 2017 by eresources. We have recently added Cochrane Clinical Answers to our A-Z list and DiscoverEd. 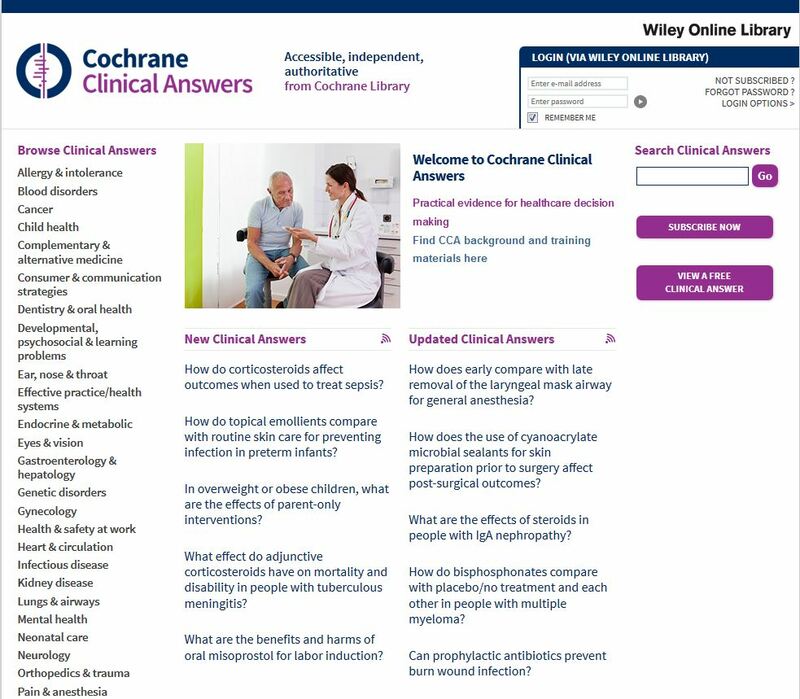 Cochrane Clinical Answers (CCAs) provide a readable, digestible, clinically focused entry point to rigorous research from Cochrane systematic reviews. They are designed to be actionable and to inform decision-making at the point of care. Each Cochrane Clinical Answer contains a clinical question, a short answer, and an opportunity to ‘drill down’ to the evidence from relevant Cochrane reviews. This entry was posted in New e-resources and tagged Cochrane Clinical Answers, database, Medicine, Nursing, Wiley on September 15, 2016 by eresources. We are about to reload all of our Oxford Reference Premium package e-book titles in DiscoverEd to take account of edition changes, additions and deletions. A list of the 313 titles currently available in the package can be found here. Please note we also have access to additional titles on the Oxford Reference website out with the above package, these will remain on DiscoverEd. This entry was posted in Updates and tagged Art & Architecture, Bilingual Dictionaries, Biological Sciences, Classics, Computing, e-books, Earth & Environmental Sciences, Economics & Business, English Dictionaries and Thesauruses, English Language Reference, Food & Nutrition, History & Archaeology, Law, Literature, Mathematics, Medicine, Military History, Mythology & Folklore, Names & Places, Natural History, OUP, Oxford Reference Premium, Performing Arts, Physical Sciences, Politics & Social Sciences, Quotations, Religion & Philosophy on July 12, 2016 by eresources. We have trial access to ACLS Humanities E-Book package until the 5th April. This electronic resource includes 4,315 full-text, cross-searchable books in the humanities selected by scholars for their continuing importance for research and teaching. Lists of titles can be found online at: http://www.humanitiesebook.org/titlelist.html. The project includes both in-print and out-of-print books and many prize-winning works. It is a ongoing collaboration of the American Council of Learned Societies, various constituent member learned societies of the ACLS (http://www.humanitiesebook.org/societies.html), and over 100 publishers. 300-500 titles are added every year. To access HEB, please go to http://www.humanitiesebook.org. –> Select Browse from top toolbar. –> Click on any title. This will bring you to a screen with information about the book. –>To view the full text of a chapter, click on the chapter title in the table of contents. You can select Search from the top toolbar to look for specific titles. To browse through HEB’s special series, select The Collection from the top toolbar and click on the links for series such as the College Art Association Monographs: http://www.humanitiesebook.org/the-collection/series_CAA.html and the Cambridge University Press series: http://www.humanitiesebook.org/the-collection/series_CamUP.html, the Society of Biblical Literature series: http://www.humanitiesebook.org/the-collection/series_SBL.html, and the Records of Civilization series: http://www.humanitiesebook.org/the-collection/series_ROC.html. This spreadsheet, with 4,315 titles in all, represents the total number of books on the HEB site as of Dec. 2014. This list is formatted as a downloadable Excel spreadsheet and includes author, title, publication information, ISBN, LC catalog number, subject area, direct URL, and date live on HEB. Fields currently covered include Area and Historical Studies in the following: African, American, Asian, Australasian/Oceanian, Byzantine, Canadian, Caribbean, Central European, Comparative/World, Eastern European/Russian, Economic, Environmental, European, Jewish Studies, Latin American, Law, LGBT/Queer Studies, Medicine, Methods/Theory, Middle East, Native Peoples of the Americas, Science/Technology, Women’s Studies. HEB also encompasses the fields of Archaeology, Art and Architectural History, Biblical Studies, Bibliographic Studies, Film and Media Studies, Folklore, Linguistics, Literature, Literary Criticism, Musicology, Performance Studies (theater, music, dance), Philosophy, Political Science, Religion, and Sociology. This entry was posted in Trials and tagged African, American, Asian, Australasian/Oceanian, Byzantine, Canadian, Caribbean, Central European, Comparative/World, e-books, Eastern European/Russian, Economic, Environmental, European, Humanities E-Book, Jewish Studies, Latin American, Law, LGBT/Queer Studies, Medicine, Methods/Theory, Middle East, Native Peoples of the Americas, Science/Technology, Women's Studies on February 13, 2015 by eresources.